I have been going to this restaurant with my family and friends for ten-plus years. Try their fried rice next time you go. It is the second best item on the menu, and probably the best 'yang chou' fried rice you will ever have. The Dank, Elmo! The Dank! Sounds good except for the liver. I hate liver. Haven't been in years, but there's always a line out the door, as I drive by on my way to Hoa Binh. I would go fairly mad with all those condiments and probably ruin a perfectly good bowl of noodles by using more than I should. If it doesn't kill ya it will make you stronger. Oh yeah and right next door is Newport, yum the house special lobster. Your picture makes the place looks bright and cheery. Their kuetiau (sp?) is very good, reminds me of Indo. My office is hooked on their food ansd usually orders them on weekly basis. You had me at Fresh Thai bird chilis. Mmmm. Buuurn. I do know where this place is. I went to try Siam Taste of Asia about 8 weeks ago and they were closed for another 45 minutes, so I drove around, exploring the area since I have never been near there (nope, never been to Little Saigon at all). Saw Trieu Chau and noted it 'cause I had seen it on Yelp enough. Aside: If you haven't tried Siam, YOU NEED TO. Crispy seabass with green curry. PRONTO! The broth is all important to me, so you can bet I am going to try this place. Promise. And I love yang chou fried rice! Thanks! That's one I'll definitely order next time. LOL! God forbid someone at Trieu Chau listens to all this talk about the divey-ness and turns the place into Uncle Moe's Family Feed Bag! BTW, that episode of the Simpsons is one of the best ever! It also has Bart selling his soul to Milhouse, and in turn, he sells it for pogs. Milhouse: "Remember Alf? He's back! In pog form!" Yep, couldn't agree more. As you can see in the last shot, I also left the liver untouched. Blech! The parking is also a nightmare if you get there at the wrong time. Luckily, I went early. No lines, and I didn't even get a chance to sit with a stranger. I've had to on one previous occasion though -- but thankfully those people did their toenail grooming before they came. One of these days I plan on trying each one out. It's a veritable condiment buffet! Exactly. This place will test the mettle of anyone who really wants to do Asian food the way it's usually done in Asia (especially SouthEast Asia), in an un-sanitized hole-in-the-wall. This ain't Bennigan's, that's for sure. I was thinking that when I put up the picture. Though it's not that scary in the daytime, because you see where the stains are. And oh yeah, I must inform people that the place closes at 5 PM. I'll have to try their kuetiau. Sounds awesome. HAHA! You got me there! ;-) In fact, I just said to my friend the other day when we made another Trieu Chau run, "You know, the more I make the drive here, the closer it seems". Next, it'll be Siam Taste of Asia...I've heard nothin' but praise, including yours. My husband and I are pretty bummed when we found out that Noodle Avenue is closed. Just like you, we live in Irvine...and don't feel like driving. I have to thank Diana for the hint on the kwetiau sapi. I'll definitely try that on my visit there. I've eaten at Siam 8 times in the past 10 weeks or so (!) and have tried the beef basil, papaya salad (extra spicy mmmm), grilled beef salad, chicken larb, chicken pad thai, egg rolls, fried tofu (a MUST), and that crispy sea bass. Everything is good, but I would recommend the fish and beef basil above the rest. Ah, a fellow Noodle Avenue fan. 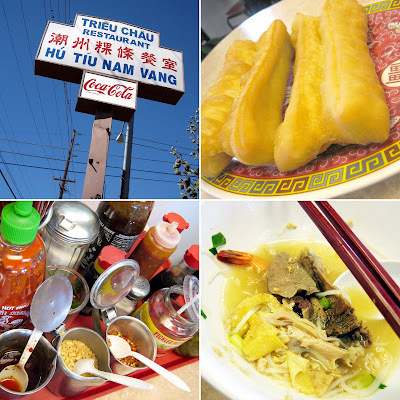 There aren't many of us (which is why they went under)...but trust me, Trieu Chau is soooo much better! Even if it is a bit of schlep. But it does seem shorter the more you visit. Holy smokes! 8 times in 10 weeks? OK. I'm convinced. BTW, I'm so backlogged with posts. I still have to write up on my trip to Sushi Murasaki (another rec of yours!) and Renu Nakorn. I am also a Noodle Ave. fan. I can't recall exactly the time. But in the summer, one day I went to Noodle Ave., I saw the sign of change of ownership outside. While suspecting, I went in and found the food still the same. The man stood behind the counter looks like relative or friend of the previous owner??? I hadn't have a chance to go back again. Now very surprised to learn that it's closed. I, too, saw the sign change over the summer. But they apparently didn't serve the same food anymore from that point. If it is the same owners, I'm not sure their decision was the wisest one -- especially with prime soup slurping season upon us. And there's people like us -- I'll have noodle soups whenever! Just a bit info that I know. Please correct me if I am not laser precise. 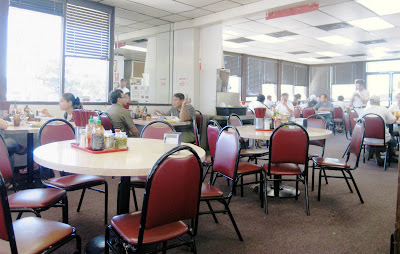 Noodle Avenue was owned by the son(s) of NEW Trieu Chau at the corner of Brookhurst and Westminster. Trieu Chau (TC) serves an almost identical menu with New Trieu Chau (NTC). I was told (not confirmed) that once they were the same company. 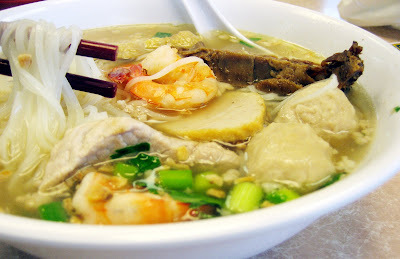 IMO, TC has a better dry-style yellow noodle (soup on the side) and a thicker soup. I personally like to eat wonton with a lighter soup that NTC serves. So, NTC is my choice for wonton soup (with large white noodle/ho fun/hui thieu) and TC is my choice when I am craving for yellow dry noodle. In addition, TC has a really delicious home-made fish ball while NTC has a really delicious shrimp/crab balls (goh yong). I hope this helps. hahah.. If I got fried doughnut served to me, I would have assumed it was a free appetizer like bread, but I would probably eat it anyways! Thanks for the background. I've always wondered how they were all connected. Now I know! But TC is TC (Top Chef) in my book, simply because I'm a thick, rich broth fan! You and me both. I ate it thinking it was free, but was glad to pay for it when I found out it wasn't. Besides I didn't want to argue with them -- I intended to come back often! We've been going here for nearly 20 years now. I remember when they last renovated and my family almost died of withdrawal waiting for them to re-open. It's a great restaurant with the same waiters/family members, same cooks, same menu. It's the first thing I get after coming back for holidays. But yes, there is a ton of MSG in the soup, which is a little unnecessary. There's another restaurant in the same plaza that has really good friend lobster.